Uncle Sam long has allowed states to set the rules governing how Medicaid works, and a dozen or so of them have decided, with the purported goal of increased fiscal rectitude, to impose harsh rules to force poor, sick, disabled, and aged program participants to work more or to seek employment. But taxpayers might be better served if the frugal-minded turned greater attention to Big Pharma’s insidious role at the state level in causing Medicaid costs to skyrocket, threatening budgets and creating conflicts in funding other public programs like education and transportation. The Center for Public Integrity (CPI) and National Public Radio deserve praise for investigating how corruptive, drug-maker money has overwhelmed state officials’ efforts to corral soaring costs of prescription medications covered by Medicaid and governed by a patchwork of rules in each of the nation’s 50 states. 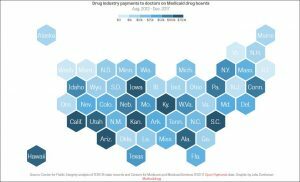 [A]round the country, drug companies are working to influence state Medicaid drug cost controls to keep their profits flowing. Meanwhile, the cost of Medicaid is ballooning, not only because the program expanded in 33 states and the District of Columbia under the Affordable Care Act. Medicaid accounts for more than a quarter of 26 states’ budgets, pitting the costs of classrooms, roads and public defenders against paying for health care. And prescription drugs are helping drive the increase nationwide. From 2008 through 2016, Medicaid drug costs grew almost 50 percent per patient, helping to nearly double the program’s drug spending to $31 billion. [D]rug companies have infiltrated nearly every part of the process that determines how their drugs will be covered by taxpayers: giving free dinners and consulting gigs to many doctors on the obscure committees advising state Medicaid programs; asking speakers who don’t disclose their financial ties with drug companies to testify about their drugs; and paying for state Medicaid officials to attend all-inclusive conferences where they can mingle with drug representatives. Beyond that, drug makers use other tactics to get their products paid for by the Medicaid programs: lobbying state lawmakers to achieve their goals or helping doctors fill out extra paperwork to get Medicaid to pay for the costlier drugs … The result is that Medicaid sometimes spends more than necessary and may pay for medicines inappropriate for patients. Statehouses have become over-run with high-paid Big Pharma lobbyists with big sway. Utah may have 104 lawmakers, but they’re swarmed by 36 drug-maker lobbyists. Flaks and influence-peddlers twist lawmakers’ arms over almost any attempts to provide oversight on Medicaid drugs, including moves that might benefit taxpayers with little or no effect on drug makers. In my practice, I see not only the harms that patients suffer while seeking medical services but also their struggles to access and afford safe, efficient, and even excellent medical care, especially with prescription medications proving more and more costly by the day and even downright dangerous. It’s unacceptable that elected officials, at the state and national levels, dance like serpents to cash-tossing Big Pharma charmers rather than helping tens of millions of Americans who fret about rising medical costs and even medical bankruptcy in household fiscal crises caused, in no small part, by the rising costs of prescription drugs. Partisans have pursued with zeal their Medicaid work-benefit plans, seemingly ignoring that studies show these steps will be costly to put in place, won’t save a lot of money, and may slash health coverage for 1 million to 4 million Americans, many of them youngsters, chronically and mentally ill, elderly, disabled, and already part of the working poor. Big Pharma, meantime, persists in its brazen profiteering, including its not-so-subtle seeming con of no one less than President Trump. Although he may think his jawing about drug prices is causing industry leaders like Pfizer, Novartis, and Merck to freeze their already sky-high product prices, experts have seen through the makers’ wink-wink ruse: The firms simply are postponing their price hikes, or they’re holding the line not on their most popular and pricey items but on their low-volume, low-profit goods. Americans shouldn’t be fooled. They need, especially in the upcoming mid-term elections, to let officials — at all levels of government — know that they can’t and won’t be conned by Big Pharma or self-interested “experts” into paying too much and getting too little for valuable drugs and public health programs like Medicaid. Not only will they say they will try to help patients while they’re really benefiting Big Pharma in Medicaid, they’re also aiming to slash at the health support program overall most in states where they won lots of support from poor voters who would be most hurt by Medicaid cuts. The states involved in a court-based attack on the Affordable Care Act’s protections against insurers denying coverage based on pre-existing conditions will, research shows, most harm their own residents: 9 of 11 states with the highest rates of preexisting conditions among adults under 65 have signed onto the lawsuit to strike down the ACA, Kaiser Health News Service reported. They’re pushing so-called association health insurance plans, slashing funding for outreach for ACA coverage, and even pushing younger, healthier Americans toward skimpy plans. Experience has shown association plans too often failed to provide benefits when patients needed them most, meaning they paid for worthless coverage. And prominent business groups that long had pushed for association plans while attacking the ACA have suddenly turned around and decided they can’t and won’t provide the alternative that they campaigned for, claiming it was cheaper and better. They’re, in effect, admitting the skimpy plans aren’t any good. We all deserve better than this, right?